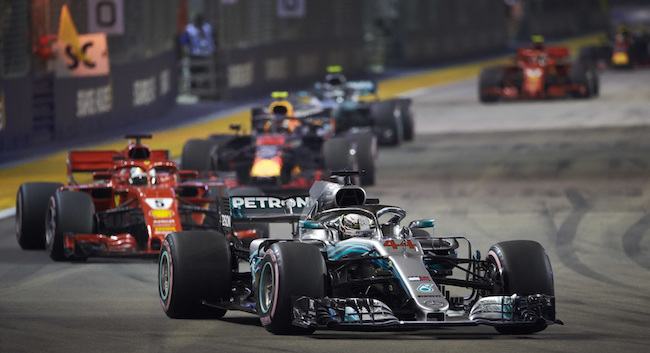 Under the white-hot spotlights of the Marina Bay Street Circuit there were no big stage nerves for Lewis Hamilton, as the Mercedes driver delivered another pitch-perfect performance to extend his championship lead over arch-rival Sebastian Vettel. This time it was the German’s Ferrari team that fluffed its lines, as Formula 1’s Managing Director, Motorsport Ross Brawn reveals, but while the battle for the lead was settled early on there was plenty of action to enjoy further down the order. What an amazing weekend for Lewis Hamilton. On Saturday, an incredible Q3 lap resulted in a pole position that was to prove crucial on Sunday, when he dominated the race from start to finish. The result and the gaps at the front don’t really tell the story of just how untouchable Lewis was yesterday and he produced a masterclass in extracting the most out the package at his disposal, pushing when he had to and managing the tyres where possible. The win is an important step, if not yet the decisive one, in his duel with Sebastian Vettel. It’s also proof that Mercedes, the dominant force of this hybrid era, is still working to improve in areas where it has maybe lost some ground in recent times. Mercedes has won four of the last five races in Singapore, but rarely has it proved to be as competitive as this weekend. There are many possible explanations for this, starting with a car that, unlike last year’s, seems better-suited to tracks such as this. There’s also the undoubted ability to get the most out of the tyres, as could be seen from the fact that in qualifying Mercedes had the quickest car in sector three of the track, proving they could make the tyres last for a whole lap, which was not the case for Ferrari. Last, but by no means least, there’s Lewis, who seems to improve all the time. When you are at the top, there’s no room for complacency, a mantra that Mercedes and its champion drivers continue to follow with aplomb. While Mercedes leave Singapore in high spirits, Ferrari must be somewhat concerned by their form at Marina Bay, and in recent weeks. After the summer break, the Italian team was dominant, winning in Spa and getting both cars on the front row in Monza. However, since then, the spell has been broken. At its home race, the defeat could be put down to various incidents, but in Singapore, both Mercedes and Red Bull were better. Not by much, as on the streets of Marina Bay the gaps separating the top three were hardly a chasm, but by enough, as third in qualifying and in the race for Vettel seemed about the right result. The men in red admitted they made the most of what was available to them and they need to work out why as soon as possible. In the race, Vettel and his team opted for an aggressive strategy, pitting early for Ultrasoft tyres, rather than the more obvious Softs, precisely because they knew they couldn’t win by playing it safe. The gamble didn’t pay off, but it was probably worth a shot. The gap in both championships is not yet insurmountable, but it is significant, especially against a strong rival in the habit of winning. Ferrari can count on a car that has always been competitive and on drivers who know how to fight for a title, but now they need to turn things around, starting in Sochi. Max Verstappen celebrated second place in fine style and it was well deserved, as the young Dutchman squeezed every last drop of performance out of his Red Bull, first when he unexpectedly put it on the front row on Saturday and then on Sunday with an impeccable drive that showed real maturity. In his two tussles with Vettel, on the opening lap and then as he rejoined the track after his pit stop, Max didn’t put a foot wrong. After that, he even managed to close on Hamilton when they came up behind traffic, but even then he avoided unnecessary risks, perhaps aware that he didn’t have a real chance of winning. It shows that the Dutchman has all the hallmarks of a future champion. It's not enough to just produce phenomenal performances in some races if others are marred by silly mistakes, but more and more Verstappen's race are characterised by not just prodigious pace but also composure. Max is growing in stature and he now needs a car with which he can always fight for victory, not just in certain situations. And even if Red Bull is a relatively young team, it has shown through their past success that they know how to do that. Fernando Alonso professed himself to be “really happy” on Sunday night in Singapore and his seventh place meant he could claim to be the ‘best of the rest’ and the only driver from outside the top three teams to finish on the same lap as the winner. Certainly Fernando put in yet another superb display. His was a relatively lonely and, for him, maybe a slightly boring race, though I’d venture that driving for 110 minutes at an average speed of around 165 km/h in a cockpit where the temperature is above 50° C, can hardly be categorised as boring, but despite that Fernando delivered a performance of consummate skill. He ranked the result “a small win” and while that is certainly true, I’m sure that his satisfaction was tinged with a degree of regret at not having a car capable of fighting for the win, which is what his talent deserves. He has twice won at this track and finished on the podium a further three times, usually without the benefit of having the best car and again on Sunday, he demonstrated that he is still at the top of his game. On a track where overtaking is far from easy, there were plenty of good duels, even if, with the exception of a couple of moments between Vettel and Verstappen, those contests were almost all for places lower than seventh. There were long close-fought battles, such as the one between Sergio Pérez and Sergey Sirotkin, who gave it their all, sometimes breaking the rules. Some made me think of a fencing match, for example the fight between Charles Leclerc and Pierre Gasly, two talented youngsters who next year will be at Ferrari and Red Bull respectively. In all, it was a great show, which the public and viewers at home would have appreciated, full of grit and determination and a couple of fouls that required the ref to blow his whistle. All the drivers fought to the end, even if points or a podium were out of the question. Of course it would have been more exciting if those battles had been for the top spots, but as is usual in Singapore that wasn’t the case. We are well aware there is work to do to enable the cars to do battle at close quarters, to allow the talent and ability of the drivers to shine through. It’s a process that is beginning to take shape, initially in the form of changes set to be introduced in 2019, before even more comprehensive changes come into force from 2021 onwards. At the same time, we must also work on creating an environment in which a greater number of teams can fight for the top positions. There’s a lot to do, but if we all pull together then we can ensure that Formula 1’s enormous potential can be fully deployed. That’s what the fans want and, let’s not forget that collectively they are the sport’s greatest asset.